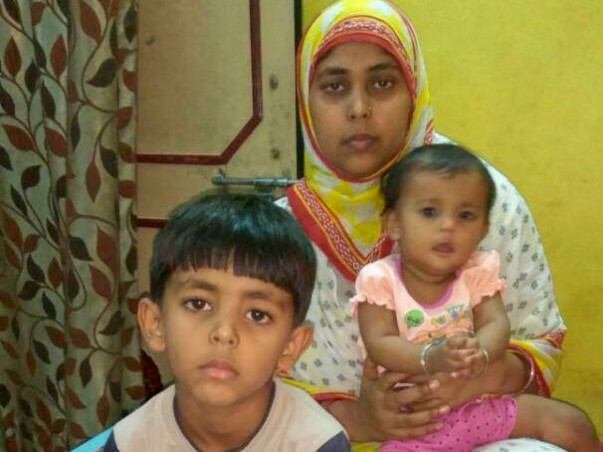 Mohammed Arshad a 35 year old from Allahabad who was once full of happiness and optimism and was enjoying life with a beautiful loving wife and two naughty children (age 5 years & 6 months respectively). He had a very small scale marble fitting business (contractor) which helped him earning his bread and butter with an annual income of Rs 60,000/-. In late 2016 Mohammed Arshad was diagnosed with Myelodysplastic syndrome, a very rare and uncommon blood disorder(http://www.leukaemia.org.au/blood-cancers/myelodysplastic-syndrome-mds). 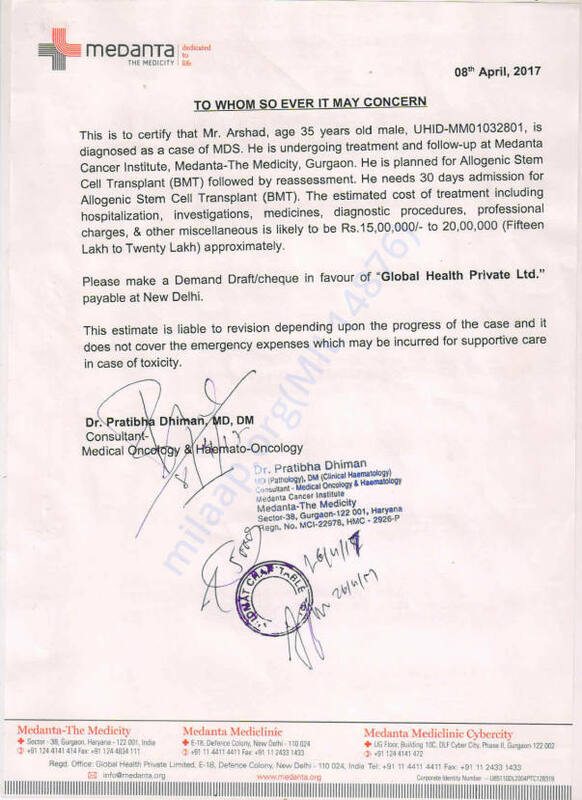 For about 4-6 months he underwent medical treatment at Sanjay Gandhi Postgraduate Institute of Medical Science Lucknow (A relatively cheap hospital), however still the bill raised against his treatment was Rs. 3-3.5 Lakhs. 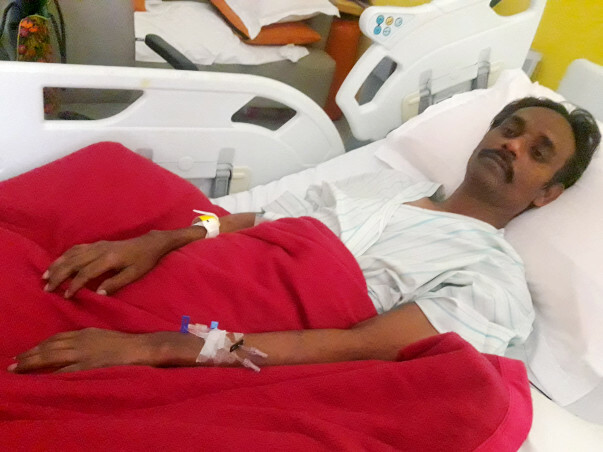 With his condition deteriorating day by day, his case was becoming difficult and hence the doctors in PGI Lucknow advised him to consult Medanta Hospital. 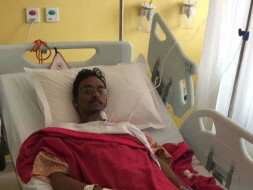 Medanta being an expensive hospital, Arshad initially refused to get treated there however his family and friends motivated him and assured that the funds would be arranged. In February 2017, he visited Medanta - The Medicity Hospital where several tests were conducted to identify the stage of the disease and the further course of action. His doctor, Dr. Pratibha Dhiman suggested that the only option left was Allogenic Unrelated Bone Marrow Transplant as none of his family member proved to be his potential match. 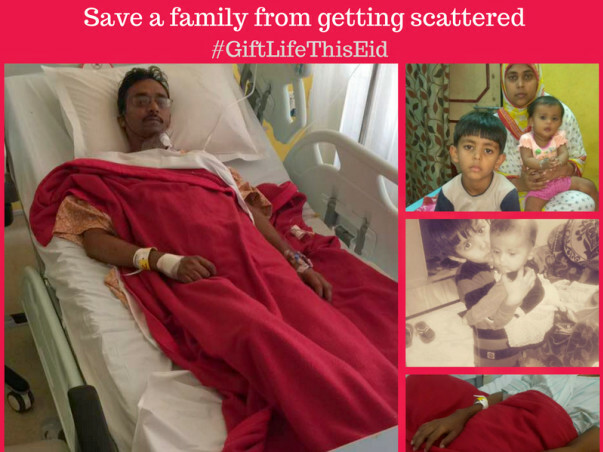 Mohammed Arshad’s case is one of the few astonishing cases as he found a willing unrelated bone marrow donor within a short period of time. However since Arshad has no funds remaining the cost of the transplant proves to be a major hurdle. The estimated cost of the treatment including hospitalization, investigation, medicines, diagnostics procedures, professional charges, & other miscellaneous expenses is likely to be Rs. 15,00, 000/- to 20,00, 000 ( Fifteen Lakhs to Twenty Lakhs) approximately. 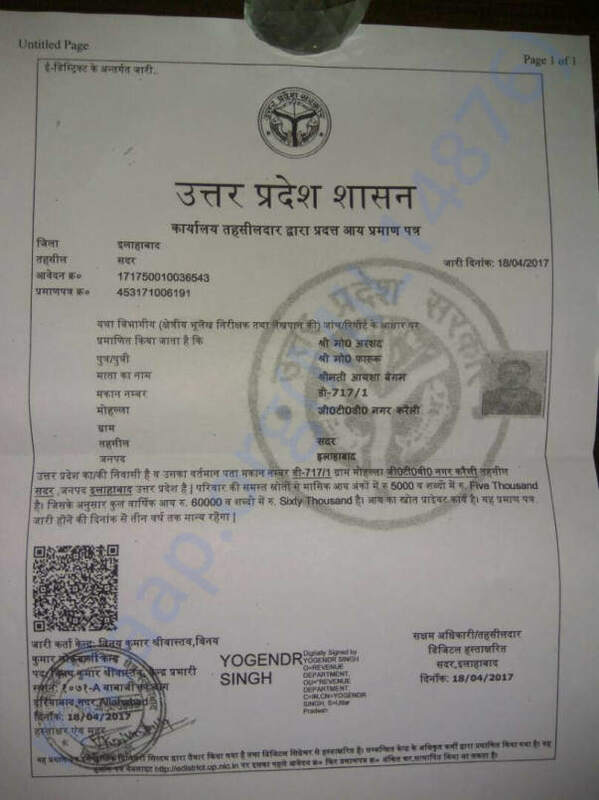 Till date he has already taken Rs. 11,00,000/-(Eleven Lakhs) as monetary help from is extended family (brothers and other relatives) and hence there is very little scope of borrowing money from them again. Since Arshad is left with no alternate source to gather this huge amount. Therefore, it’s a kind request to all to help us raise this amount so that there are no hindrances in his treatment and he can soon go back to his home to celebrate EID with his kids and wife. It is with great sadness that I have to inform you all of the death of my beloved friend Mohd. Arshad. He fought like a warrior against MDS. His Bone Marrow Transplant was successful but unfortunately he couldn't manage to defeat post transplant complications and infections(90 days which are the most crucial period after the BMT) . I, Sajid Khan, on behalf of Mohd. Arshad's family would like to take this opportunity to say THANK YOU to each and everyone who supported Arshad and stood firmly with his family in their difficult days. With your help and donations, we will be now clearing all the outstanding bills. Once again a warm thanks for all the valuable contribution, support and prayers. May allah shower all his love and blessings on each one of you and Arshad's soul rest in peace. The family is very obliged and thankful that people have come forward during the holy month of ramadan and contributed to the treatment. A Stem cell donor has committed to donate his stem cells . The treatment is in progress .We would however need more support to complete the treatment .Allah bless the donors ! May Allah provide him speedy recovery and all the health and happiness together with his family.